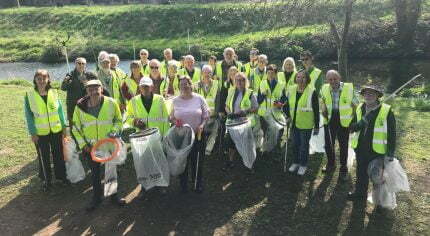 Farnham is a tidier place thanks to a record number of volunteers who gave up their time to pick up litter during the 2019 Spring Big Pick Week. Throughout the week, 200 volunteers from the Bourne 5th Farnham Cubs, Farnham Ramblers, Badshot Lea Bloomers, Farnham Brass Band, Bourne Conservation Group, Hale Scouts, Beavers & Cubs Wrecclesham,Rowledge Village Tidy Up and Heath End Gardeners arranged community litter picks and removed sack loads of rubbish from grass verges, pavements and open spaces. Farnham Town Council provided litter-picking tools, sacks and safety gear as well as disposing of the bags of rubbish if needed. The week ended on Saturday 30 March with a town centre litter pick. Nearly 40 volunteers collected a total of 40 sacks of rubbish from South Street, The Borough, West Street, Station Hill and other town centre streets. As well as a multitude of everyday rubbish such as cans, bottles and cigarette ends, the litter pickers found some more unusual itemsincluding a pair of garden shears, a cool bag complete with bottles, an umbrella, a bicycle and an old cricket roller! The Town Council encourages people to use litter bins where provided or to take home their rubbish and recycling. Farnham Town Council organises litter picks every year to support Keep Britain Tidy’s campaign for a national spring clean and as part of the Farnham in Bloom activities.